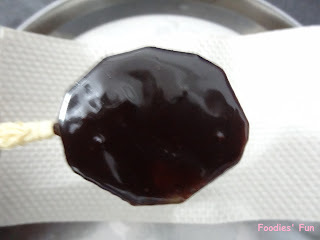 I have always had this kiwi dipped in chocolate fountain in any party or occasion (obviously where they have put up chocolate fountain and kiwi as one of the pop). 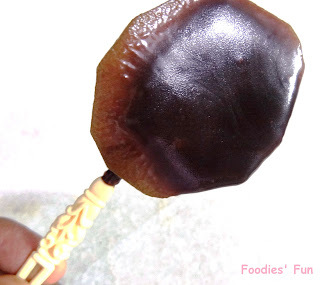 But had never thought would try it at home until my cousin Rushit mailed me a picture from of chocolate kiwi pops and persuaded me to try it out. It looked tempting and luckily also had kiwi available at home. 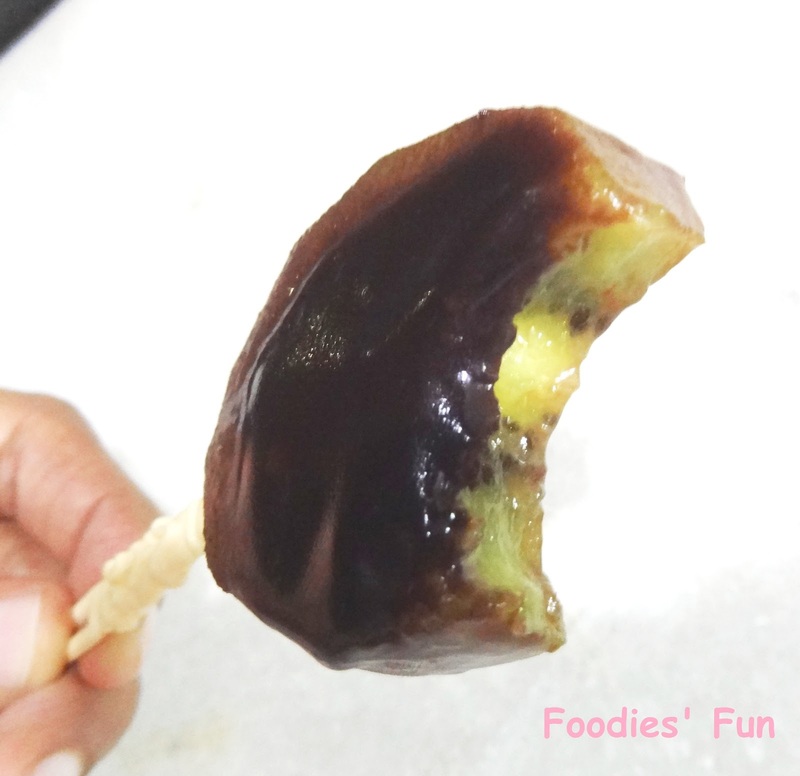 Thought of trying it out and within next 20 minutes Choc Dip Kiwi was ready. Trust me it is very simple and quick to make. 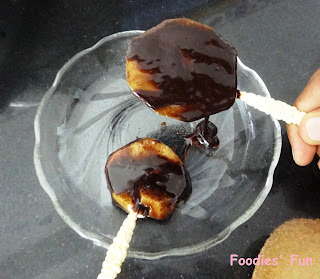 Tempt your guests by serving this yummy dessert at home. Peel off the kiwi and slice them. Carefully insert tip of the fork to one of the edge of kiwi. 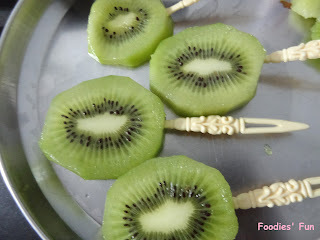 Though I did break 1-2 slices of kiwi while inserting fork. Keep them aside. Then melt the chocolate slab. For this take a deep cooking pot with water in it. Let the water boil. Put the chocolate slab in a small cooking pot. And place that pot in the deep cooking pot. Keep on stirring the slab and let the chocolate melt. As it melts, sprinkle very little milk in it. 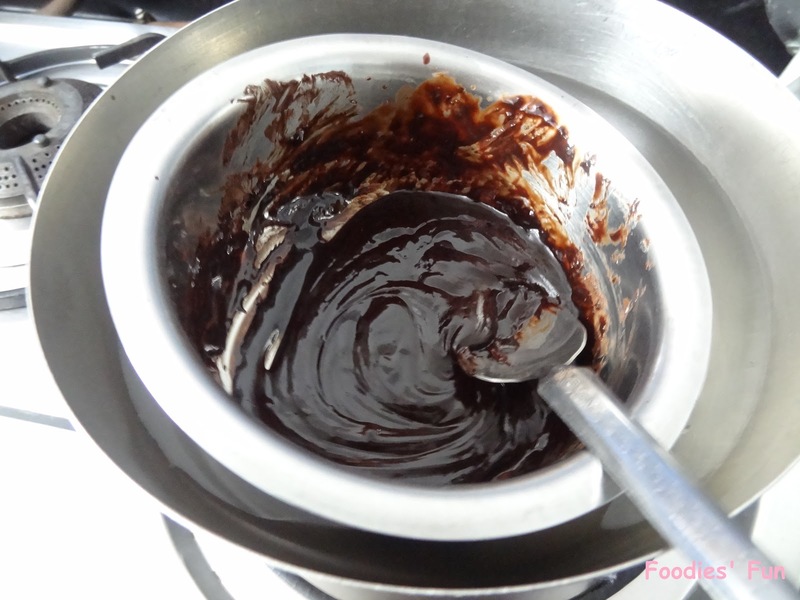 Stir it well so that you get thick chocolate. Or you can also melt the chocolate in a microwave. I don’t have one so I used two cooking pot and stove. 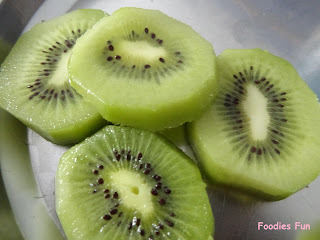 Apply this chocolate evenly on the kiwi slice. Make sure you apply the thick chocolate so that it drips less comparatively. Mind it your kitchen platform will get little messy. Put in a tray and refrigerate for 30 minutes.